"Who are you praying to?" At CARA we've asked a lot of questions about prayer over the years. 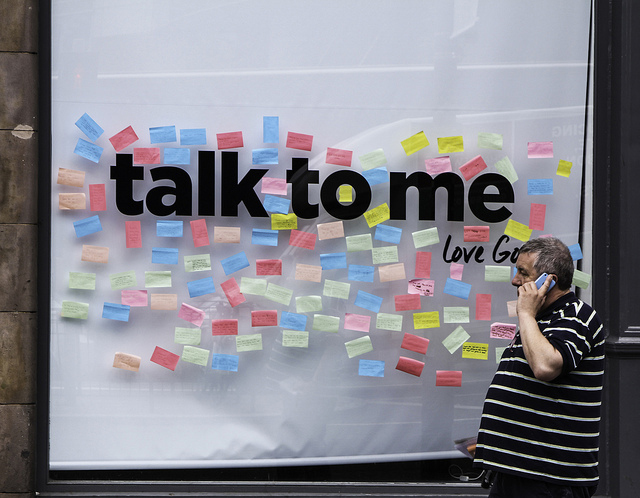 But we never thought to ask more specifically about just who people are actually talking to. Now we know a bit more. CARA recently conducted a national poll of Catholic parents, ages 25 to 45, to explore the 21st Century Catholic family. This survey, completed in September and October 2014, includes interviews with 1,014 self-identified Catholic parents resulting in a sampling margin of error of ±3.1 percentage points. The research was made possible by Holy Cross Family Ministries. Among the results on prayer, we learned this is a multilingual conversation with 40% of parents praying in Spanish and 59% in English. One percent pray in some other language (e.g., Polish, Portuguese). Seventy-one percent of parents agree “somewhat” or “strongly” that prayer is essential to their faith (80% among weekly Mass attenders) and most parents are regularly talking to God. Thirty-six percent of parents pray at least once a day. Another 23% pray less than daily but at least once a week. One in five pray less than weekly but at least once a month (20%). Twelve percent pray a few times a year. Only 9% say they rarely or never pray. When asked why they may not pray regularly from time to time, parents were most likely to say the following explains their lack of prayer: busy schedule or lack of time (51% “somewhat’ or “very much”), having missed Mass (39%), or that prayer just did not cross their mind (39%). When praying, a majority of parents say they “always” or “most of the time” are praying to God the Father (74%) or Jesus Christ (59%). Fewer indicate praying this often to the Holy Spirit (45%), Mary (44%), or the Holy Trinity (33%). Some pray to or ask the intercession of a guardian angel (31%), a deceased family member or friend (26%), a specific saint (22%), or saints on their feast days (16%), “always” or “most of the time” when they pray. We also asked about when parents pray. In descending order, parents are most likely to “always” pray: during times of crisis (42%), when feeling anxious or depressed (34%), when feeling blessed (31%), before bed (26%), during Lent (18%), during Advent (18%), when they wake (13%), before meals (13%), and at family gatherings (10%). That last result is remarkable as the data indicate there is no shortage of families gathering or dining together. More than half of parents say they eat together as a family every night (51%) and more than a third do so a few times a week (35%). Also, outside of these meals, 62% of parents say they gather for family time at least once a week (e.g., movie night, game night, discussions, prayer). Although many aren't praying together as family they are often praying for their family. The most common reason for prayer among parents is for the wellbeing of their family. Eighty-three percent do this “most of the time” or “always” when they pray. A majority of parents say they are “always” or “most of the time” saying a specific Catholic prayer (57%) or simply talking to God when they pray (58%). Fewer than half pray this frequently for their own wellbeing (45%) or for world issues (41%). Nearly a third say that they reflect on something while praying (32%). About one in five meditate (22%) or discern something (20%). 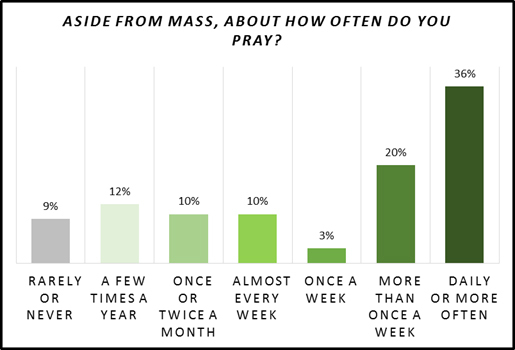 Fifteen percent “always” or “most of the time” participate in religious devotions while praying. Parents are most likely to typically use the following while praying: the Bible (41%), Catholic prayer book(s) (39%), and other Catholic publications including prayers (33%). Most often they are using these resources in print rather than in electronic formats. Twenty-two percent of parents have at some point been involved in a Catholic small group that meets regularly for prayer, Bible study, or faith sharing. Twenty percent have participated in Eucharistic Adoration. Sixteen percent of parents indicate that they have invited non-family members to their home to pray with their family at some point. Among those who have done so these instances most often are related to general household celebrations (58%), Advent or Christmas (47%), or a time when someone in the home or community was ill or passed away (43%). Only 16% of parents pray the rosary at least once a month (7% at least once a week). Weekly Mass attenders are most likely to pray the rosary at least once a year (68%). Among those who do pray the rosary, half say they typically do so with their family (18% of all Catholic parents) and half do not (18% of all Catholic parents). Sixty-four percent of parents do not pray the rosary. Among these respondents the most common reasons cited for not doing so were having no desire or need to pray it (39%), never learning or forgetting how to say it (24%), and time issues (17%). Because I like to do it alone. It makes me feel like I can be more open and honest and closer to God. My prayers seem like intimate conversations. Done at night, most of them already sleep. As a child my family only prayed at holiday meals, which is when we do as a family. Image courtesy of Lawrence OP.